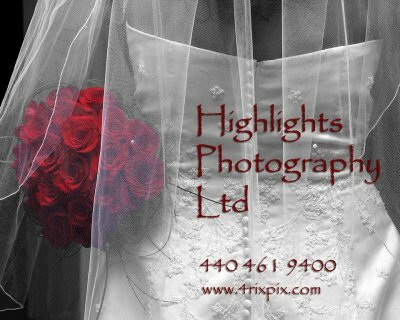 Highlights Photography is committed to providing you with an individualized, comprehensive photography package of the highest quality. Select one of the following galleries below to view a sample of possibilities for creating your own personal photographic memories. Highlights is located 20 minutes East of downtown Cleveland in Lyndhurst OH easily accessible from I-271 or I-90. Please click on a photo to open that gallery. Some galleries have galleries within them, some only images. Click to open or click to enlarge. Rick did such a great job at our September 2009 wedding. Family and friends commented what beautiful pictures he took without making himself be known at the wedding. He is very personable, open to ideas and captured the personality of my wedding party. He was referred to me by one of my bridesmaids who used him as her photographer, I recommend him to anyone! Rick did an amazing job on our wedding day! He was referred to us from a friend of mine and we were very happy with our pictures. He was very relaxed and fun to be with. I loved the fact that I didn't feel like he was "in my face" during the reception. He took shots that I never knew were taken and captured all the moments that we cherish most. I would use him again in a heartbeat! WOW, I have had my proofs back for a while now and not only am I impressed everytime I look at them so is everyone else!! I would recommend Rick hands down!! He was the best and I have the best wedding pictures. Rick did an excellent job with our wedding. Our album is priceless. He is truly a talented guy, fun to work with, and easygoing. We looked at photos again on our first anniversary are so pleased that we chose Highlights.